The school is preparing Boys & Girls for ICSE and ISC (+2.) Examination. The Doon Cambridge school provides the fullest opportunity to a student to develop his/her all-round personality in addition to scholarly pursuits. The students are offered both the streams - Science & Commerce at the +2. level. 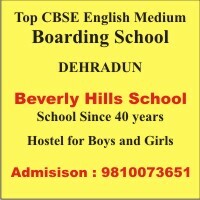 Our achievements in academic has been remarkable - we generally have cent percent results with a higher tally of credits & distinction) in the examinations conduct bythe ICSE) New Delhi) but equal emphasis is laid on extra curricular activities such as debates, declamations, dramatics, games, shooting, skating, science quiz contests) trek to hills, swimming) horse riding) health dub) gymnasium and other adventure sports. Library: The School Library with its wide range of books to meet the demands of every age group and taste, endeavors to develop the reading habit and the appreciation of literature among the students. laboratories The school provides to the students, the use of Physics, Biology, Chemistry, Home Science and Psychology Laboratories equipped with the most modern apparatus. These encourage students to learn through experiment and research. Computer The school provides a well-equipped computer center to make the students know and learn the new technology.